River Road Chateau Outdoor Upgrades – A guest post by Stephen Finnerty…check out his fine work at TriCity Graphic Design! I just have to share with you some images I was asked to take of River Road Chateau’s outdoor upgrades. 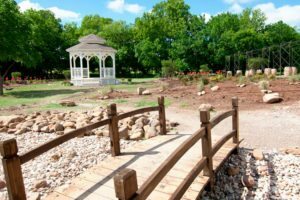 Larry Wormington, the owner, and his staff, led by the amazing Krysti Peabody, have been busy little bees with one goal in mind: making this the top outdoor wedding venue in DFW. Since the transfer of ownership earlier this year, Larry, Krysti and the fine folks at CMD Residential Construction have nearly completed the remodeling of the interior of Belle Manor – a five bedroom plantation style home available for rent by brides and their friends / families, (pictures coming soon to show you this transformation), and have just completed a major upgrade of the grounds in front of the elegant chateau. Brides and their wedding photographers are going to go nuts when they see what they have waiting for them. In the area where parking was previously set, (yes, they built a new, fully-graveled parking area due east of the venue) the owners have created a fantasy garden setting incorporating a gazebo, four, half-moon, seated trellises – modeled after those seen in the incredible gardens at Villandry Castle in France’s Loire Valley, a wine barrel and roses trellis pathway, six garden benches with stone walking paths, river rock beds with foot bridges, an antique wagon, and a three-tiered fountain! The entire south section of the venue, located between the Chateau and the Wedding Meadow is flowing with rock paths and a wide variety of flowers and shrubs that enhance the photo shoot locations. 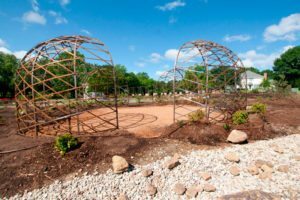 Although I love gazebos, my favorite area is the four, French-replica, half-domed trellises – complete with benches and soon to be dripping with foliage. The structures were arranged such that no matter what time of day or season a bride will be tying the knot, one of these beauties will be set in the best possible light. If you are interested in renting River Road Chateau for your special day or perhaps for your wedding anniversary photos, send us a note here or if you prefer contact Krysti Peabody at Krysti@riverroadchateau.com for available dates and rates. For all the shots of this elegant outdoor wedding venue, check out my blog post here. Come and experience an amazing wedding! We offer rustic wedding venues and elegant country wedding venues near Dallas and the DFW metroplex. River Road Chateau would be honored to serve you!